[SatNews] Thomson Video Networks announces the CANAL+ Group, the leading pay-TV provider in France and French-speaking countries worldwide, has deployed the award-winning ViBE® EM4000 HD/SD encoder to power the migration of its entire CANALSAT satellite offering to an all-HD delivery infrastructure based on the H.264 codec. Working in tandem with Thomson Video Networks' NetProcessor multiplexer/video processor, Amethyst III high-density redundancy switch, and MediaFlexSUITE network management system, the ViBE EM4000 provides premium eight-channel compression density together with broadcast-quality upscaling for the new all-HD service. The first premium encoder to offer a density of eight HD MPEG-4 AVC channels in a 1-RU chassis, the ViBE EM4000 has recently been upgraded with an all-new, broadcast-grade SD-to-HD conversion capability. By combining premium HD MPEG-4 compression with the ability to upscale an SD video source to HD in a single solution, the EM4000 has enabled CANAL+ to move CANALSAT quickly to an all-HD operation while, at the same time, reducing capital and operating expenses. For the migration project, known as "TOUT HD," CANAL+ has modified its entire head-end architecture to build an all-HD MPEG-4 satellite platform for CANALSAT. The new all-HD offering went live on July 1. 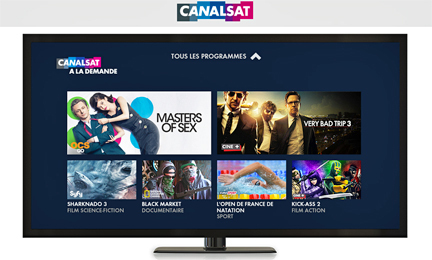 "The migration of CANALSAT to an all-HD offering is a significant milestone for our company. It was critical that we deploy encoding technology that could provide powerful upscaling capabilities, high density, and features for DVB subtitles and Dolby E transcoding. The ViBE EM4000 is the perfect fit for our requirements," said Frederic Vincent, EVP technology and information systems, CANAL+ Group. "With its global footprint and industry leadership in premium content, themed networks and pay-TV offerings, CANAL+ Group is the perfect customer — and the CANALSAT migration is the perfect project — with which to demonstrate the efficiencies and cost savings of our ViBE EM4000's new upscaling function," said Eric Louvet, vice president, worldwide sales and field services, Thomson Video Networks. "Media enterprises like CANAL+ understand that the ability to broadcast in HD is not only a key differentiator, but it's critical to meeting viewer demand for premium picture quality. With its seamless ability to upscale SD sources and encode HD MPEG-4, in addition to its industry-leading channel density and streamlined management of DVB subtitles, the ViBE EM4000 is the ideal solution for these requirements."